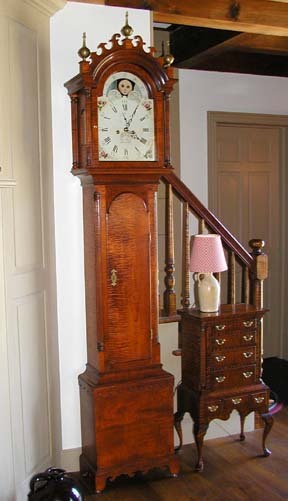 Presently I offer three styles of tall case clocks; the Thomas Jackson, Pennsylvania Chippendale and the Country Chippendale. All are available in Tiger Maple, Cherry and Mahogany; the Country Chippendale is also available in Pine. Prices range from $5600. to $11,500. All the clocks have hand-painted dials and handmade reproduction movements. Each is powered by a precision American-made brass movement. 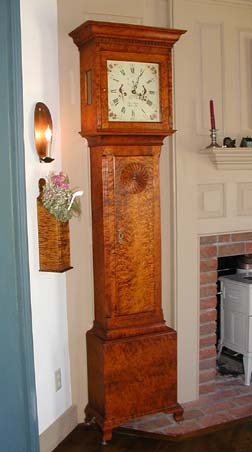 This handmade reproduction, made by David Lindow, is an eight-day bell strike movement. It is the only one like it known to be available in the United States. The anchor-recoil escapement is extremely reliable and very rugged. Once regulated, it maintains accurate time keeping. If the clock is oiled every three to four years, the movement should last for many generations.